BetweenDesignResearch is a specialized headhunting consultancy which selects and recruits fashion designers and professionals exclusively for the fashion business. Young luxury brand is looking for a head designer for the ww collection. Managing experience is required. 10 years of experience are required. Very well known accessories brand is looking for an accessories collection merchandiser. 8 years of experience are required. very well known accessories brand is looking for WLG designer. 6 years of experience are required. Strong chinese luxury brand is looking for a visual merchandiser for the asian retail network and showroom. 8/10 years of experience and a luxury background are required. well known italian accessories brand is looking for a merchandiser. 8 years of experience are required. contemporary luxury brand is looking for a shoes designer consultant for the womenswear collection. Young luxury brand is looking for a visual merchandiser manager, man/woman collection. 5/10 years of experience are required. Communication agency specialized in the fashion industry is looking for a full time project manager. 4 years of experience are required. BETWEEN DESIGN RESEARCH is a specialized headhunting consultancy which selects and recruits fashion designers and professionals exclusively for the fashion business. Our expertise spans the entire fashion industry: from luxury labels to leading brands and high street fashion. The company was founded in 1999 by Elisabetta Berla and Sabrina Damassa who both have wide-ranging professional experience in the world of fashion and accessories BETWEEN has become one of the leading Italian consultancies, selecting and recruiting fashion designers and professionals at an international level. The experience that the two founders have acquired in the field of both design and the finished product guarantees an efficient and accurate recruitment service BETWEEN’s professional headhunting and talent scouting provide the crucial link between creativity and the fashion business. At a time when changes in the conception of the fashion product, its production and distribution, all take place at ever-increasing speed, efficiency is vital; it has become essential for the whole framework of the fashion system to interact International styles and trends are monitored globally and include a sharp eye on the perceptive and fast-growing Far Eastern market. Selection, recruitment and problem solving. BETWEEN supplies professional profiles that rigorously match company requirements, thus helping clients implement their branding strategies and increase their market competitiveness. Thanks to the vast network of resources built up over the years by the founders, BETWEEN has access to the top professionals in the fashion system. BETWEEN’s recruitment research is based on direct contact. BETWEEN protects the privacy of both the client and the recruit. All information received and all profiles in our database are treated as highly confidential. BETWEEN’s fee is negotiated as a percentage of the successful candidate’s annual salary. BETWEEN’s database is constantly updated and holds the details of over 3000 Italian and International professionals; these details include background, specific skills and work experience, as well as personal aptitude for successful team work and languages spoken, in order to assess the optimum level of employment. Designer graduates from the most important, internationally recognized fashion schools, which are constantly monitored by BETWEEN. Elisabetta Berla and Sabrina Damassa are members of the graduation juries in various fashion schools, notably: La Cambre in Brussels, IED in Milan, Unit F buro fur Mode in Vienna. Professionals already employed in at various levels of the fashion label industry: from luxury goods through to high street fashion, from clothing and accessories to perfumes and cosmetics. Our database includes people who can satisfy all levels of skill, from highly qualified managers in key roles, through to junior positions with potential for promotion. database please fill in the following form and send us your CV. We have never worked with BETWEEN, how can we start? What information do you need from us prior to commencing a research? We will ask you for a detailed description of the job position, general information regarding your company framework, where possible the salary available for the post to be filled, the reason why the position is available (i.e. creation of a new role within the company structure, or substitution) and all other details of particular skills required. How long does a research take? This depends on the type of position to be filled and the level of skills required We normally send you the short listed CVs within a week of receiving the signed contract. The research of highly qualified candidates with very specific skills can take longer. How many CVs will you send us? We usually supply about 4-5 CVs although this can vary depending on the job role. If a suitable candidate is not identified, the research is extended. Can we make direct contact with candidates? The CVs we send you do not contain personal contact details of candidates. If you wish to meet a suggested candidate you may do this exclusively through BETWEEN. Direct contact with candidates can only take place once a job offer has been made. We prefer not to hold interviews at our premises. May we arrange the meeting in your offices? 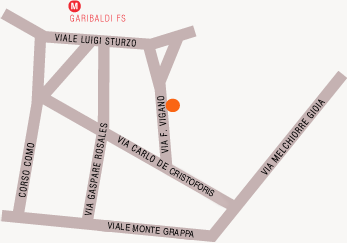 We are more than happy to offer this service to our clients BETWEEN offices are located in Via Viganò 4, Milan. What happens if we are not happy with the new recruit?